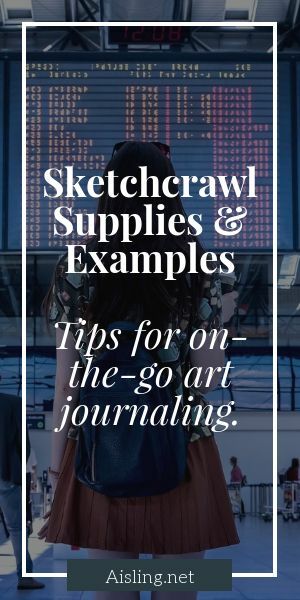 A sketchcrawl* is a full-day of sketching or drawing in a journal, or on some other art materials such as paper, canvas, etc. It’s usually part of a stroll, alone or with a group, looking at scenery in one general location. A small notebook or sketchpad as a journal. A pen or pencil, for drawing lines. An eraser, if you’re sketching with a pencil. Something to add color, like watercolors (and water, and a brush), or colored pens or pencils. Tape, to fasten ephemera in your art journal. Snacks, in case you get hungry. Optional: A camera (you can use your phone), in case you want to add printed photos to your journal, later. My advice: Keep your art supplies simple and as light (and perhaps small) as possible. What does a sketchcrawl journal look like? 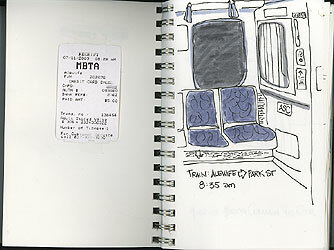 Sketchcrawls are great practice for creating travel journals, too. The materials & techniques are the same, so why not try a sketchcrawl somewhere near your home? For me, sketching – with pencil, pen, markers, or watercolors – is a relaxing way to enjoy the scenery, wherever I am. Whether it’s a local scene or a trip abroad, art journaling helps me notice – and appreciate – more of what’s around me. * At one point, the owner of the Sketchcrawl site claimed that the term “sketchcrawl” was trademarked. Some of us objected to that, since we’d been using the word for a considerable time before he announced his trademark plans. Updating this page, when I checked the US Trademark database, I didn’t find “sketchcrawl” in it. Whew! I’m glad he changed his mind, as – at the time – it caused a rift in the journaling community. i’ve added my blog , hope you like ?